Google makes their first South-East Asian acquisition. A Singaporean chat app called Pie has been the first acquisition for Google in the region. The app Pie is a chat for work, that lends functions that everyday chats might or might not have. The app allows you start a group chat in your workplace and allows you to send files and share files via cloud services in a snap as well as syncs to all workplace devices such as your tablet or desktop. Now that Pie has been acquired by Google, Pie’s services will shut down and their engineers will spearhead a team Google intended to build in Singapore. 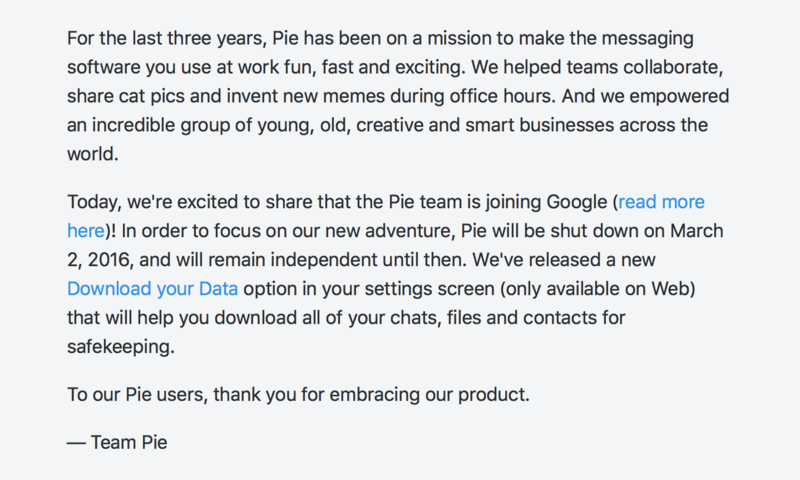 Pie left a message on their website to their users, indicating their new adventure and the acquisition from Google.